Music heals. And there will be a time for that. Right now is the time for families to embrace and for our community to try to comprehend the devastation that has befallen us. In respect for everyone affected by the events of the past week, our November 17 and 18 concerts in Thousand Oaks and Oxnard are being rescheduled for future dates. Watch for further details regarding new dates, arrangements for ticket holders, and how the New West Symphony will honor our community’s love and resiliency at future concerts. 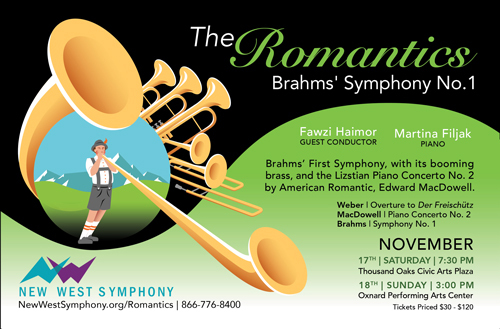 The New West Symphony presents its November program, “The Romantics,” on Saturday, November 17th at the Thousand Oaks Civic Arts Plaza and Sunday, November 18th, at the Oxnard Performing Arts Center. The Romantics Music Director Candidate Fawzi Haimor leads a program of three works from the romantic era, featuring the talents of Cleveland International Piano Competition Gold Medalist, Martina Filjak, in her New West Symphony debut. It also marks the Symphony’s first performance of American composer Edward MacDowell’s virtuosic, Liszt-inspired Piano Concerto No. 2. Closing the program is Johannes Brahms’ majestic First Symphony, which took Brahms 14 years to complete, and which, with its soaring final movement chorale, has often been called the Beethoven 10th. Tickets available at www.newwestsymphony.org/the-romantics for the 7:30 p.m. show on the 17th in Thousand Oaks and the 3 p.m. show on the 18th in Oxnard. Martina Filjak came to international attention by winning the Gold Medal, the 1st prize and the Beethoven prize at the Cleveland International Piano Competition in 2009, which brought her numerous engagements in the United States and internationally. Prior to that, she won 1st prizes at the Maria Canals Piano Competition (Barcelona) and the Viotti Piano Competition (Vercelli), and was a laureate at the Busoni Piano Competition. In recent years, Ms Filjak has performed with esteemed orchestras including The Cleveland Orchestra, San Diego Symphony Orchestra, The Florida Orchestra, the Strasbourg Philharmonic, Barcelona Symphony, Bilbao Symphony and the Granada Symphony; the Deutsche Radio Philharmonie, the Staatskapelle Weimar; the Israel Chamber Orchestra as well as the Orchestre Symphonique de Nancy. She has been heard in major international venues such as the Concertgebouw Amsterdam, Konzerthaus Berlin, l’Auditori and Palau de la Música Catalana in Barcelona, Zankel Hall at Carnegie Hall in New York, Boston’s Jordan Hall, Teatro San Carlo in Naples, Sala Verdi in Milan, Salle Gaveau in Paris, Musikverein and the Konzerthaus in Vienna, NDR Hall in Hannover, Residenz in Munich, Auditorio Nacional in Madrid. Her most recent conductor collaborations include JoAnn Falletta, Michael Schonwandt, Christoph Poppen, Hans Graf, Sebastian Lang–Lessing, Josep Caballe-Domenech, Tito Munoz, Christopher Warren-Green and Stefan Sanderling. The artist’s extensive repertoire ranges from Bach to Berio and encompasses more than 30 piano concertos. She is dedicated to continuous exploring of piano literature and various concert formats. Performing with orchestra takes the biggest part of her time and she frequently states that she enjoys the interaction and the exchange of energy between so many musicians on the stage. An avid chamber musician, she frequently takes part in chamber music festivals, and has participated in the recording of Schumann’s Andante and Variations with cellists Jan Vogler and Christian Poltera, released on Sony Classical (August 2013). Her recording of Sonatas by Padre Antonio Soler was released in 2011 on the Naxos label. During the 2014-2015 season, Miss Filjak appeared in Brazil and Japan and performed with the Osaka Century Symphony Orchestra and Alan Buribayev, the Slovenian Philharmonic and Marcelo Lehninger, the Sinfonieorchester Aachen and Kazem Abdullah, the Zagreb Philharmonic and Hans Graf. She debuted with the Orchestra Sinfonica La Verdi in Milano as well as at Milan’s Serate Musicali. Performances in 2015-16 featured her with the Staatskapelle Halle and Josep Caballe Domenech, the Bremen Philharmonic Orchestra and Markus Poschner, the Bilkent Symphony Orchestra and Stefan Sanderling, the Phoenix Symphony and Tito Munoz the San Antonio Symphony and Karina Canellakis, the Las Vegas Philharmonic and Donato Cabrera, and the Pro Musica Chamber Orchestra and David Danzmayr in performances of concerti by Beethoven, Ravel, Brahms, Saint-Saens and Rachmaninov. Martina speaks seven languages. Fortunately, for an active performer, she loves to travel. Fawzi Haimor has worked with Orchestre Philharmonique du Luxembourg, BBC Philharmonic Orchestra, Orchestre de Chambre de Paris, NDR Radiophilharmonie Hannover, WDR Funkhausorchester Köln, Orquesta Sinfonica do Porto, Oulu Sinfonia and Orchestra Sinfonica di Milano Giuseppe Verdi. In the US, Haimor conducted orchestras such as The Florida Orchestra, Indianapolis Symphony, New West Symphony and New Mexico Philharmonic. He also made an acclaimed debut with the Grant Park Symphony in July 2017. Further afield, he collaborated with Qatar Philharmonic, Kyoto Symphony and the New Zealand Symphony. Upcoming guest appearances include a return to the Louisiana Philharmonic, and debuts with orchestras including Deutsche Radiophilharmonie Saarbrücken, Philharmonie Zuidnederland and Bilkent Symphony Orchestra. Haimor’s broad repertoire includes a focus on the late romantic Germanic works, 19th and 20th century Russian and American composers, plus he is a committed advocate of contemporary music and has performed premieres by composers such as Mason Bates and Kareem Roustom. An eloquent and compelling speaker from the podium, he equally excels in outreach and education projects.